Four lessons from First John, Ephesians, John, and Joel depict God's love for humans as primary and as the source of all love. These lessons show that God's love overflows, redeems, unites, and renews. The first lesson depicts God as love and the source of all love. The second lesson concentrates on God's redemptive, overflowing, and uniting love in Christ. The third lesson comes from Christ's high priestly prayer to God describing God's love for Jesus and all who believe in Christ. The fourth lesson shows the ultimate restoring and renewing power of God's love. The second unit offers five lessons drawn from Psalms, John, and Romans and revealing God as protector, preserver, healer, comforter, and savior of the people. The first lesson reveals total reliance on God as shepherd who cares for every need of the sheep. The second lesson reveals God's love in sending God's only Son for human salvation. The third lesson recounts the Resurrection event in which God's love is displayed as victory over death. The fourth lesson elaborates on the force and power of God's love in Christ to reconcile, justify, and preserve the believer. The final lesson in this unit focuses on Jesus' words describing himself in the role of the Good Shepherd. Four lessons from the Book of Jonah highlight God's unconditional love for humans and the natural world, as well as God's continuing care and concern for individual and group relationships and developments. The first lesson concentrates on God's care for the natural world and humanity. The second lesson focuses on God's providential care in preserving Jonah in the belly of the fish. The third lesson focuses on God's love and preservation of a nation of people who repent and turn to God. The fourth lesson depicts and elaborates on God's pervasive love for all creation. Developed for use with the student book based on the Uniform Series, this leader resource provides a wealth of information, planning ideas, and lesson guides for each of the 13 lessons in the quarter. This resource includes detailed study of the biblical text, suggestions for developing lessons, teaching options, maps, and charts. It features articles that explore biblical themes related to the passages studied in the lessons. Available in regular print, as a downloadable file or an eBook. Free supplemental resources related to each lesson enhance teacher preparation and small group participation. The free Current Events Supplement offers a way to connect each week's lesson to a timely event or topic in the news. The supplements can enhance all resources using the Uniform Series. Stan Purdum was a parish minister in Ohio for several years. He currently works as a freelance writer and editor. He writes curriculum for Cokesbury and edits Emphasis and Proclaim, both nationally circulated preaching journals. He formerly was executive editor of Homiletics, the most widely used preaching resource in America. He has a Doctor of Ministry degree from Drew University Theological School. Stan's other books include Roll Around Heaven All Day and Playing in Traffic, both accounts of his long distance bicycle journeys, as well as New Mercies I See, a collection of parish stories of God's grace. Stan and his wife live in North Canton, Ohio. They have three grown children. 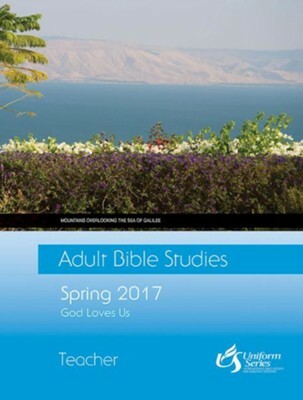 I'm the author/artist and I want to review Adult Bible Studies Spring 2017 Teacher - eBook.